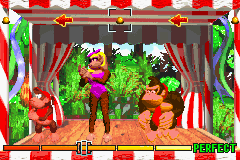 Candy's Dance Studio is a minigame that appears in the Game Boy Advance remake of Donkey Kong Country, and as its name implies, is a dance studio run by Candy Kong. The studio is similar in appearance to Candy's Save Point from the Super Nintendo version of Donkey Kong Country, and serves as its replacement, due to the fact that players can save their game at any point on the map screen. Her studio has distinct red and white banner with red and white drapes with a wooden floor about four feet above the ground. It is big enough to hold a number of dancers, and the natural environment can be clearly seen around it. At Candy's Dance Studio, Donkey and Diddy Kong will jump into a Dance Barrel and dance alongside Candy Kong to a song, similar to a Dance Dance Revolution game, except that moves are performed by pushing either buttons or a direction on the control pad. If the Kongs have good timing and make few mistakes, they will win a Photograph. Candy has a dance studio in each of the game's six worlds. The first one, located in Kongo Jungle, contains a relatively easy dance challenge, although the challenges get progressively harder down the road. If the Kongs can pull off a perfect dance session at any studio, they will receive a special Photograph from Candy as a bonus. The exterior of Candy's Dance Studio for Kongo Jungle. This page was last edited on April 13, 2019, at 14:48.